Located along the spectacular coast lines of Sentosa's Siloso beach. Accelerate from Zero to 120km/hr below 2 seconds. Swing Solo, in tandem or triple with friends and family. Get a AJ Hacket membership for 20% off worldwide. Collection Information "Tickets must be redeemed at the reception counter at AJ Hackett, please have your iVenture Card present." Swing, swoop, scream towards the horizon, reaching speeds up to 120km/h. 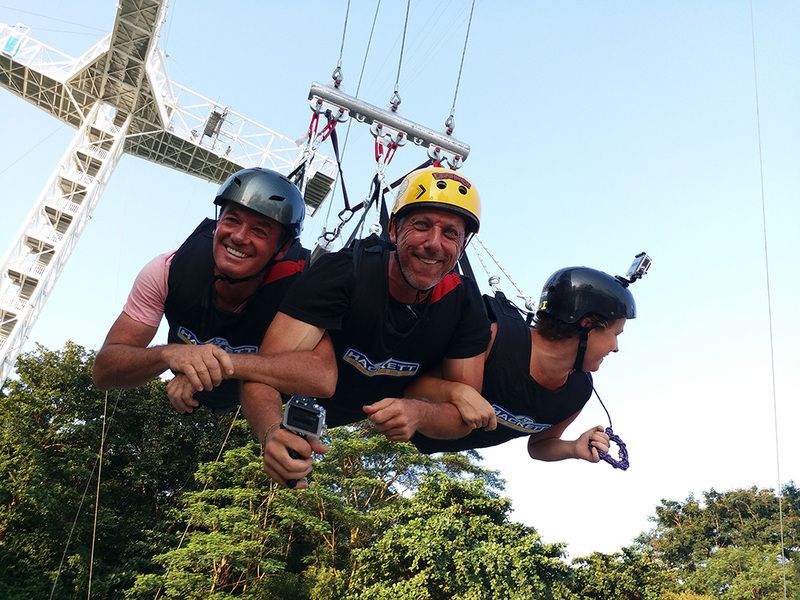 Singapore's only real giant swing gives you and up to two of your family or friends a chance to have a kind of fun that you've never experienced before! Strapped facing down, you are winched to 40m above the ground. In front of you, the amazing view of Siloso Beach and an awesome Singapore Sunset. A smile creeps on to your face because you know, in a few seconds, that view is going to be a blur. You get the go signal to pull the cord... and you do. The swing starts with a drop and then your group swoops towards the horizon. You all scream as you hurtle towards the beach, only stopping once you reach the apex. And on that instant, you realise that you are actually having fun! You swing a few more times, allowing you to enjoy the moment, and then you are pulled to a halt. You take off the harness, and you and your companions have an awesome experience to look back at to laugh and talk about for days to come. By MRT stop at Habourfront station, proceed to the third floor (Level 3) VivoCity, to reach the ticketing area and the entrance to the Sentosa Express Monorail Station, which is specifically in lobby L. Exit the Express train at the Beach station and walk along Siloso beach, a 5 min walk will bring you to the doorsteps of AJ Hackett Sentosa.